While Jesus was with his disciples and went around teaching to all the crowds who came to hear him, He often spoke in parables. A parable isn't a true story, it's a story that Jesus made up to teach a lesson. Have you ever heard of the story of Goldie Locks and the Three Bears? How about the Three Little Pigs? These stories are easy to remember, just like a parable. Jesus told them so the people would remember them. The difference between children's stories and parables is that children's stories are too make believe, bears don't talk and live in houses, and neither do pigs. But while the stories Jesus told weren't real stories, they were about real life things. They were for adults and didn't have cartoons or make believe characters. Even though you are young, you can learn these stories too. They show us how to act towards others, how to please God, and they teach us things about what Heaven is like and how we can live with him someday. After Jesus told a parable he would explain what it meant, but he only told people that were his real friends and really wanted to know him better. A farmer went out to plant his garden. As he was throwing the seed on the ground some fell on the hard path nearby and the birds came and ate them. The next seeds fell near some rocks the farmer had in a pile nearby. There was not much dirt around the rocks so the seeds started to sprout and grow the next day. When seeds aren't planted in the dirt they don't grow roots which help them stay strong and wet, which help them grow properly. So in the afternoon when the sun was very hot the little plants that started to grow among the rocks withered away and died because they had no root in the ground. 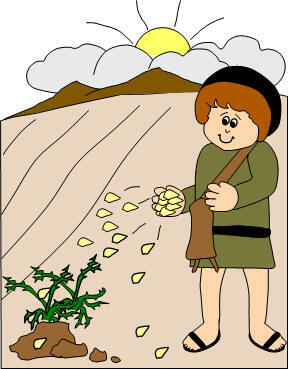 As the farmer continued to throw seeds onto the ground some of the seeds fell among the weeds and thorns that he hadn't pulled out. The thorns grew faster and taller then the seeds, so the seeds couldn't get enough sunlight and were choked out by the thorns. Finally, some seed fell on the good soil that the farmer had worked and dug holes for the seed to go into. Those seeds made plants and those plants produced lots and lots of vegetables. Just like when you're listening to you Sunday School teacher, your parents or pastor. They are trying to tell you more about God and about how to get to Heaven someday. When they talk to you about these things they are planting a pretend seed in your mind. The seed is a story about Jesus and as you learn more the seed grows and gets bigger and you eventually will know lots about God and be able to tell others about Him. If you hear them talking about Jesus but don't understand, you need to ask questions. If you don't ask, you will forget what you learned and it will be like the seeds that fell on the path that were eaten by the birds. You will forget and the seed will be gone from your mind and it won't grow. Sometimes you might learn something about God and you will be excited about it but you don't learn more. It helps to read Bible stories and pray and go to church if you can. If you don't do any of these things you won't have a good friendship with God. So if you don't learn more about God the pretend seed in your mind won't grow and it will be like the seed that fell on the rocks. It grew only for a short time and then it died. The next seed is the one that was choked out by the thorns. This can happen when you hear a lesson about God and then you start to worry about all kinds of things. You might worry about your parents, your friends, or if you have all the coolest stuff. By worrying you will choke out the pretend seed in your mind. Pray to God instead of worrying! The last seed is the best, it fell on the good ground. If you learn from what you hear in Sunday School and church, the seed in you mind will grow. You will be able to tell others about how great God is and God will be a good friend. Instead of growing a garden, you will be helping others know God and making Heaven grow with more people to live there.